Some products that will be available when the new Annual Catalog comes out June 1st, are available now to demonstrators, and will be come available to everyone starting May 1st until May 31st. 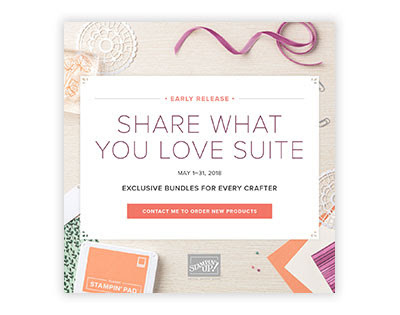 The Share What You Love Suite early release includes three different bundles, each one complete with at least one free gift. To see the bundles click here. 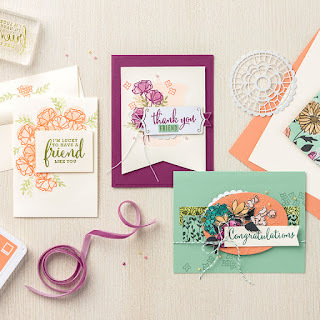 Card samples using products from the suite are pictured below and made by Stampin' Up!. Bundles may be purchased via demonstrator, customer, workshop, or online order. Bundles may be included as part of a new demonstrator’s Starter Kit (free items will be included). There are no purchase limits in place during the customer sales period. Watercolor Wings - Retiring soon!